This is an archive page for the older generation. You can find introduction and support documents here. 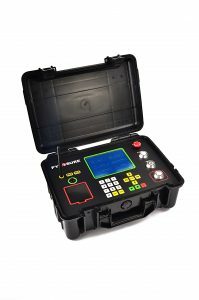 PyroSure is a state-of-the-art digital wireless firing system with incredible functionality at a great price. The system is the ideal tool for every professional show – from local events right through to high-budget pyro-musical displays. With in-built AES security, PyroSure is also perfect for stage-FX and indoor pyro. Firing modes include Manual, Semi Auto and Project (providing full choreographed musical firework displays) with 2376 individual cues available per controller. Fireworks with music are now easy to perform, even for small Fireworks Companies. The Module-24 combines a wireless module and 24 cues within an ABS case. The unit has an LED display to monitor the power level, signal strength and cue information. Cat 5 terminals are supplied in each group of 4 cues to connect a Rail-8 or to plug in a strip off flat cable SSI. The Module-24 is powered using 4 x AA HR 6 rechargeable batteries (1900 mAh and above recommended). A USB power connection is available within the battery box to supply 5 volts of power from a portable or 110/240 supply. Many USB portable power banks have a cut off point below 100 mah. As a result, external power supplies with an on / off switch should be used.